The magnificent Graybar Building is located directly east of Grand Central Terminal and is a major (thirty-five-story) deco-era masonry clad structure. The building was purchased in 1998 by the S.L. Green organization from the Helmsley portfolio of buildings. The new ownership has embarked upon a repair program for the exterior envelope and the special façade characteristics of this building. 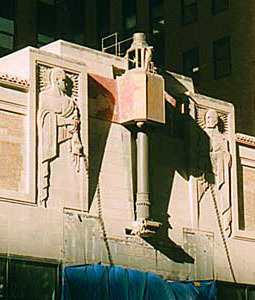 Work has been completed on the Lexington Avenue façades, which includes the entry portico with the sculptural reliefs in addition to the upper wall masonry. Work continues on the other façades and on the roofs.